It’s been only a few short days since my story was published on this site. In that time I’ve been absolutely blown away by the kindness and support that has been shown to me by all of you. Never before in my life have I been shown so much understanding and compassion by complete strangers. Thank you all so much. As sort of an afterthought, I had linked my music website at the end of my last post. From the increase in my site views, I figured that several of you have gone there to check it out. That, coupled with your encouragement for me to keep posting on this site, has caused me to decide to share with you my journey of music, which closely ties in to my religious journey. The importance of music in my life cannot be over-estimated. As a child—around 4 years old—I would simply sit at the piano and touch its keys. It was so beautiful to me. I was fascinated by it. My older sister played the violin and I would go into the yard and gather two sticks and pretend like I was playing the violin with her. Once, at church, when I was probably six, I started crying during the singing. My mom asked me why I was crying, but I couldn’t explain to her with my childish words the effect that the music was having inside of me. Music has always made sense to me. It’s always been the words I needed to speak the unspeakable. When I was 9, I got my first guitar for Christmas. I taught myself to play. When I was 11, I played my first show. When I was 12, I started a bluegrass duo with my brother. When I was 14, I started writing my own songs. But when I was 13, my parents went “plain”. This is what they called the super-duper conservative lifestyle they fell into that I briefly described in my last post. My parents’ recent religious decision impacted every area of my life, and especially music. Music was the single most important thing in my life at the time, and remained so throughout my entire adolescence. But now my parents were very much against any music that wasn’t gospel. They discouraged my musical ability and called me stupid when I shyly mentioned I would like to study music in college. I was told higher education was not appropriate for a woman and that I would lead people astray with the sinful music I was writing. 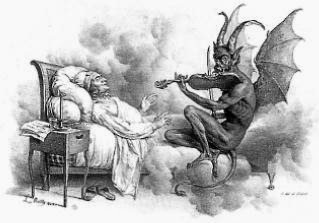 I was told that Lucifer had been in charge of the music in heaven, and as such music was a tremendously powerful tool that the devil used against people. Only if I sang and wrote gospel could I use this power for good. This is the main reason I had no relationship with my parents as a teen. They were sabotaging the single most important thing to me and telling me that who I was was not acceptable. But the problem was my music was the only thing keeping me alive. The fears, the pain, the depression, the suicidal thoughts, I couldn’t talk to anyone about in my deeply oppressive environment. But I could write about it. I could write sweet music. I could give myself a much needed outlet for my shattered nerves and try to make sense of my life. And this one thing, this one life-line that was keeping me alive is the thing my parents were trying to rip out of my life. I had no self-confidence. I was so painfully trapped inside myself, but so desperately needed to share what I had been writing about. It took so much courage and I was so desperately afraid, but one day I started singing one of my own songs in the local music store. A guy who worked there asked me what I was playing. I said that it was a song I had written. He asked me to play it for him. After I did, he said that his brother-in-law owned a small diner that did live music and I should go talk to him. I did and I got booked. I played my first show of all original material with my knees knocking and my heart pounding when I was 18 years old. I finally started feeling like there might be a light at the end of my tunnel. I was telling the world what was in my heart and they were responding back. But my parents were very displeased. I had to sort of sneak around and not tell them all that I was doing or they would have shut the whole thing down quick as a flash. Music was the single most important thing in my life at the time, and remained so throughout my entire adolescence. But now my parents were very much against any music that wasn’t gospel.But I was getting more shows. People were really liking what I was saying, the songs I played. They told me I was real, raw, that I was telling the truth. And then someone else came onto the scene. Someone that a person at one of my shows told me I should contact about a possible show. This person was a musician, an older man. He took me seriously. He recognized my talent. He got me bigger shows. And ultimately he was a dirt bag. I knew I was in way over my head and I wanted to be able to talk to mom and dad, but I knew they would never understand. We had no relationship, we seldom spoke, there was nothing but tension and acrimony between us. Small towns being what they are, somehow word got out and someone tipped my parents off that I was involved with this man. All hell broke loose. They blamed music. They said if only I had obeyed them and sang gospel none of this would ever have happened. My dad took my guitar and a hammer and threatened to smash it to pieces in less I repented. Thank goodness I convinced him I was sorry about the whole thing so he didn’t destroy my property. My guitar is a 1954 Gibson J-50 and worth about $6,000. Not that that mattered to mom and dad. After all, there was no price too high to pay when my eternal soul was involved. After that night, my dad drove me to my grandparent’s house, 500 miles away and dropped me off. He said I had acted so disgracefully that I couldn’t live in his house anymore. But what was worse, he wouldn’t allow me to bring any of my instruments. He kept me from them all and told my grandparents not to let me touch one. He said I was addicted to music, that addiction was Satanic and I needed to “purge my system” to get rid of the “drug” that music had become in my life. He said that without my instruments, I could put God first in my life instead of making music an idol. I was shattered. Not only had I been used and lied to by an older man who had broken my heart, but I had been sent away by my family and essentially put under house arrest at my grandparents’ house. I started falling into deep depression again, only this time my one life line had been taken from me. Thankfully as the months passed things got a little better for me. Being out of that oppressive environment helped, and my grandparents were very good to me. But it was a year or more before I was able to write music again. I felt like something deep inside of me had snapped. And a part of me was afraid mom and dad were right, that all of this had happened to me because I had sinned and wasn’t using me gifts to glorify God. Eventually I got out of there. I got a degree in philosophy, and a lovely little house. I’ve met a beautiful person that I love and even more amazing is I am potentially getting signed to a booking agency. They have booked me for a month and if I do well, I’m looking at the ability to make my living doing what I was born to do and this fills me with so much gratitude and joy. My parents have changed a great deal and become so much more open minded. I think this is largely due to the sudden death of my sister from cancer, but that's another story. We have picked up the pieces of our relationship and have grown in understanding and love for one another. They are still Christians and conservative, but they realize some of the things they’ve put me through and have genuinely apologized. There are some wounds they inflicted that I have not discussed with them yet, but our relationship is growing stronger and I just try to gently handle things a piece at a time. I have learned grace, forgiveness, peace, happiness and love, but not from Christianity. I learned them from living, from growing, and from living life as honestly as I can.